What’s the next step for the future of education? AVer and Almoe Digital Solutions are bringing our AVer Education Total Solution to GESS 2018 booth #C1 at the Sheikh Saeed Halls, Dubai World Trade Center in Dubai, UAE . Showcasing our newest Interactive Flat Panel (IFP), AVerVision Visualizers, and Classroom Charging Solutions , we are planning to change the way you think about the classroom at the largest education event in the Middle East. Join us and experience the latest advances in classroom technologies, as we continue to change education and bring teachers new tools to help students express their creativity and delight on their learning journey. The AVer IFP is at the core of our Education Total Solution. As a next generation classroom display, the IFP allows teachers to easily connect with students, present digital learning material, and display content from AVer’s wide range of Mechanical Arm, Flexible Arm, USB, Wireless, and Platform Visualizers. When used with AVer’s integrated MyndShare software, teachers have the ability to instantly share learning material from the IFP screen to students’ in-class tablets, making for an extra engaging learning experience that brings images on the IFP to life in the students’ hands. Science class will never be the same! AVerVision Visualizers let students see every single detail of a classroom activity with 1080p display capabilities and high quality zoom. As the #1 brand of visualizers in the United States, our visualizer models are designed to meet the needs of varying student activities and are proven to make any classroom activity a clear and exciting experience for students. 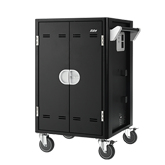 Further complementing our future classroom technology, AVer Classroom Charging Solutions provide safe, secure, and convenient classroom device charging. Equipped with AVer proprietary Cable Management System and AVer Intelligent Charging Technology, charging large numbers of electronic classroom devices is made simple and efficient. AVer Classroom Technology continues to push teaching and education into new frontiers and we want you to come experience this exciting journey with us. AVer and Almoe Digital Solutions will be redefining the classroom at GESS 2018 Booth #C1, join us!